You can either book online through our website or by phone or by postmail. To confirm your booking, a deposit of 30% of the total amount have to be paid, including 15€ of booking fees. You will receive a booking confirmation and you will have to pay the balance 30 days before your arrival. In case of cancellation from our side, in case of absolute necessity, we will suggest you other dates; If you refuse we will pay you back the whole amount already paid. 24hours after your expected arrival date, if you did not inform us about your delay or your cancellation, we get the right to relet the rent. 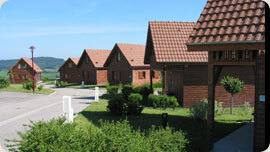 If your chalet is not relet, we will invoice you the whole amount of your booking. The payment of the deposit means you accept our rent terms and conditions. The parties accept that this contract applies under French laws. In case of disputes, the only competent court is the commercial court (Macons/Saone). During high season, arrivals are scheduled on Saturday from 4p.m to 7:30p.m and departure on Saturday before 10a.m. During low season, arrivals are scheduled from 4p.m to 6p.m and departure before 10a.m. When arriving in the Domaine, the customer has to present his booking confirmation at the reception desk and give a deposit of 250€. Accepted payment methods: Visa Card, Master Card, Check, cash, holiday voucher. All chalets are equipped with kitchen tools and bedding. Bed sheets can be rented. Inventory has to be checked and the customer has to report any issue during the first day. Cleaning has to be done by the customer. If the cleaning is not done at the end of your stay, fees of 75€ will be invoiced. The tariffs include water and electricity up to 5KW per day. If you exceed it, you will be charged of 0,15€ /kW. We accept pets. They have to be leashed, clean and quiet. A valid vaccination certificate must have be presented for each dog and cat admitted in the Domaine. Customers have access to all activities in the Domaine the whole year. Access to the swimming pool from 1st March to 1st October.